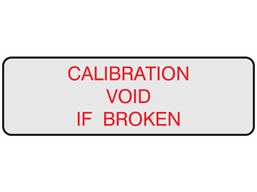 Calibration void if broken label. Tamper evident polyester. Supplied in packs of 100 labels. Tamper evident calibration labels. Calibration void if broken label. Material tamper evident polyester. These identify unauthorised tampering, and act as integrity, guarantee, warranty or service seals. These labels will fragment on attempted removal, and are non transferable. Supplied in packs of 100 labels. CA20301 Size 12mm x 38mm. Material: tamper evident polyester.